Punta del Hidalgo on the northern coast of Tenerife is anything but sunshiny or summery. Instead, harsh waves and high winds pound the rugged cliffs. It is a world away from the famous resorts and not exactly what many would want in a vacation. Even travel magazines seemed to have forgotten the beaches on this part of the island. The gloomy sketch of the North didn’t stop Punta del Hidalgo, though. In fact, all its so-called ‘disadvantages’ are also the reason why it has loyal tourists. Surfers weren’t able to refuse the call of its big rough waves. Wandering souls deem its epic mountain trails inescapable. The notorious north winds make dipping on the saltwater pools much more relaxing. Imagine all those with majestic views to match. Like most coastal towns, Punta del Hidalgo was a simple fishing village in the municipality of San Cristóbal de La Laguna. All that changed, though, come the 1930s when Northern Europeans started frequenting its shores. Soon enough, several hotels were built to cater to the ever-growing number of tourists. Punta del Hidalgo was most definitely the ‘It’ holiday spot in Tenerife up to the 60s. Guests especially loved its tranquility and staying idyllic amidst all the developments. At that time, resort giants, Playa de las Amèricas and Costa Adeje, merely trailed behind its shadow. Although now far from its glory days, the lovely little coastal town remains unique in its way. It’s still very much a resort, but more laid-back as it’s no longer in the middle of the bustle. And, even though structures are from its heyday, the stunning vistas are as striking as it was in the glory days. After Punta del Hidalgo’s golden age, other resorts soon opened. They have broader sandy shores that add to the summer-like atmosphere. It was apparent that the north just isn’t the trendy place it used to be. Eventually, the lovely Punta del Hidalgo disappeared from the tourism limelight. Even so, locals never stopped embracing its ruggedness. It was their little open secret. However, in recent years, it started gaining attention once again as word of its powerful waves spread in the surfing community. The oceanfront village is Tenerife’s surfers’ paradise, but it’s also more than that. Nestled between the marvelous Anaga Mountains and the vast Atlantic, it has the best of both worlds to offer. Compelling trails from the massif leads to its rocky shores while the calm seawater pools beside the raging current are enthralling. It seems Punta del Hidalgo is bouncing back big time. 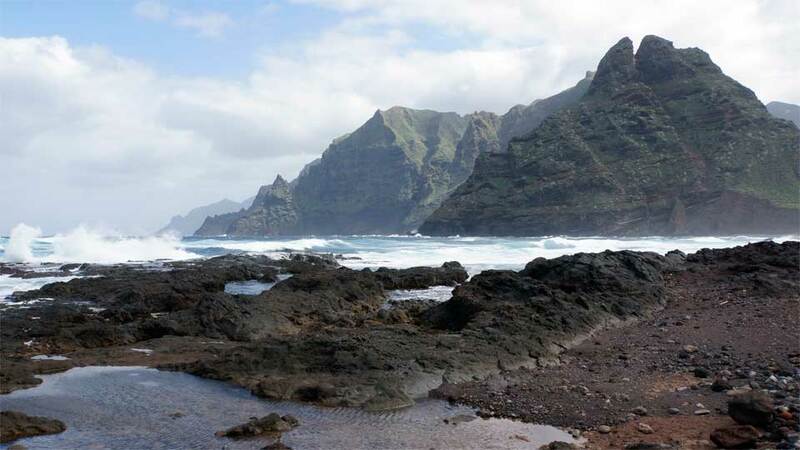 The Anaga Mountains is majestic, and it’s taking the hiking spotlight away from Teide. Along with its rising fame is the steady supply of tourists from the surrounding towns. While most people hike through the greeneries, others drive around its coasts. Punta del Hidalgo is indeed fortunate. It has splendid vistas, good roads, and the trails leading to it are incredibly scenic. The most famous one is the path to the cave village of Chinamada which leads directly to the town. The still inhabited caves and the glorious views never fail to fascinate hikers. No matter how beautiful they are though, the call to go downtown is too tempting to refuse. A meal with sublime sea and mountain view after trekking beckons. Hopping behind the wheel is also a great option to see Punta del Hidalgo. It has a winding road that offers breathtaking sights. Anaga’s massif is not only vast and towering, but it also exudes tranquility. The fields and fields of endemic flowers are gorgeous, especially during springtime. And the sea, no adjectives can suffice to describe its magnificence. Locals love their natural seawater pools, and tourists are catching up. There are none of the sandy shores full of sunbathers, umbrellas, and loungers. Vastly different from the usual beach scene, they are as beautiful, clean, and far more relaxing. Swimming in the natural pool is the same as in the sea without the big waves and strong undercurrent. They also come in different sizes. During high tide, some even body surf on the waves that come in from the ocean. The best thing about Punta del Hidalgo’s seawater pools are the overwhelming spectacles that surround them. Everything that encompasses this little town is enormous and impressive. The mountains are colossal and imposing. The Atlantic – an endless azure satin sheet. Such a host of breathtaking wonders all in one place, existing at the same time. 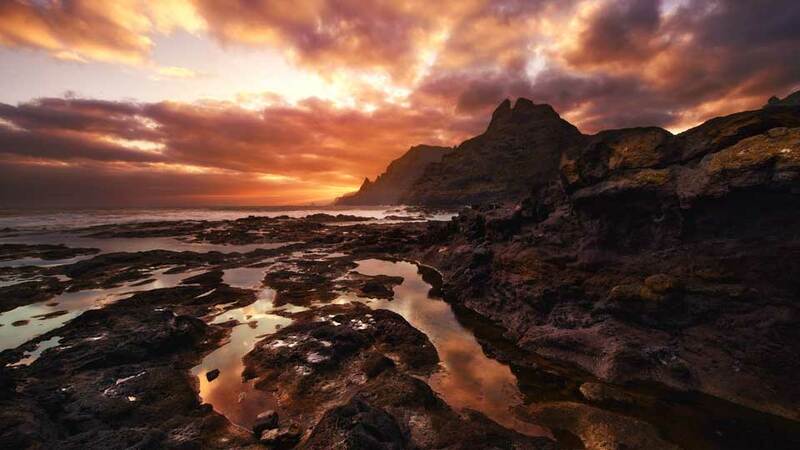 To be called the surfers’ paradise of Tenerife is a huge compliment. On the other hand, it’s also a big block of pressure dropped directly into the town. The title alone is an invite to surfers worldwide, and Punta del Hidalgo has a lot to prove. The powerful waves didn’t disappoint though. They came galloping towards the shore as they always do. The rough sea then makes sure that the wave riders couldn’t be any happier. Kayaking and board paddling are also popular in this old fishing village. When most people hear about it though, they are either shocked or puzzled. How can a town with such mighty waves offer those water activities? It’s all about timing. The waters around Punta del Hidalgo is a lot calmer before sunset. Tourists should most definitely go around the town. Learn about the culture and the locals, and try their food. Going a little farther, though, is also a must as there are two more unique and brilliant sights to see. On the northeast of the town is a 50-meter-high lighthouse that looks like it’s from the Lord of the Rings Trilogy. 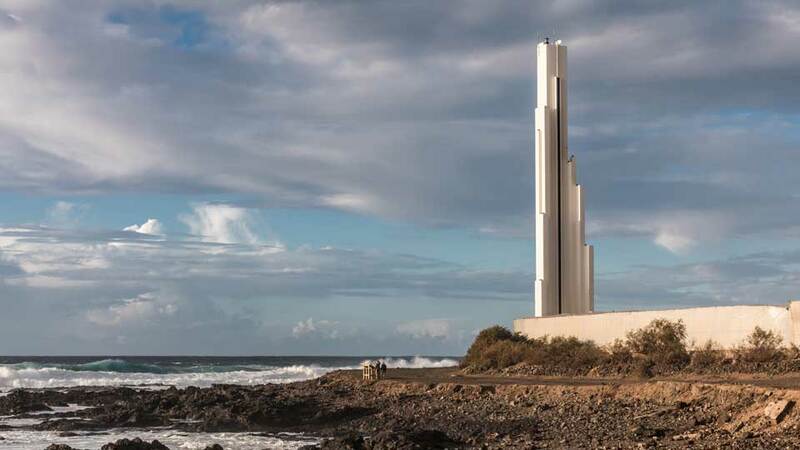 Faro Punta del Hidalgo is unmistakable and unmissable since its completion in 1992. Its angular design of irregular columns stops everyone in their tracks. For the tourists in the area, it’s a sin to miss this structure. At the edge of the Anaga massif is one of the landmarks of Punta del Hidalgo. Also called “The Two Siblings Rock,” El Roque de Los Dos Hermanos stands out in the mountain range because of one unique feature – it’s split in two. The legend behind the rock formation is quite interesting. Legend has it that two Guanche siblings fell in love. And, as they are bound to be separated because of their forbidden love, they climbed the peak and jumped off. Because of all the suffering and pain, it caused the rock to split in two. Punta del Hidalgo is a small town. Even if it lacks in land area, it more than makes up with astonishing sights. No matter where one stands or turn, there’s always something awe-inspiring to see. That’s a guarantee. When it comes to the spectacles from the hotel room, guests can have their choice. The tired hiker can have an afternoon coffee by the window with the view of Anaga Mountains. Honeymooners can watch the sunrise on the horizon from the balcony. There are two hotels and plenty of apartments to choose in the town. All guests need to do is get packing and head to Punta del Hidalgo. The OCEANO Hotel Health Spa is only a quick 2-minute walk from the beach and around 10 minutes to the center. Aside from great location, all their rooms also have a fully-equipped kitchen. The well-being of the guests is the top priority of the hotel. This large oceanfront complex has its medical spa with a team of doctors and therapists. Here, tourists can rest and heal. They can also enjoy the fitness center and outdoor swimming pool. The Atlantis Park is a throwback from the 1970s but with modern amenities. The complex is only a 3-minute walk from the beach where the natural seawater pools are. For some fun within the facility, they also have a gym, indoor and outdoor pools, and a table tennis table. The apartments in Atlantis Park are cozy and spacious. And, all have twin bedroom, lounge-diner area, and balcony. It’s particularly popular with couples and many raving how it feels like home away from home. The Marea Alta is a large vacation home perfect for large families or group of friends. It has a spectacular view of the sea as it’s only a few meters away from it. It’s also just a 2-minute walk from the natural swimming pools and excellent restaurants nearby. The house has two double rooms, two single rooms, and a 2-car garage. Guests can also lounge in the large living room or on the spacious balcony. There’s also a terrace with a 6-seater dining set where guests can enjoy the views of the mountains and the sea. Marea Alta is the best choice for tourists who want comfort, space, and to-die-for views. Having jaw-dropping panoramas is an essential vacation spot prerequisite. Trailing not very far behind is fantastic food. In fact, selfies with the sights and gastronomic delights are the most common souvenirs travelers take home from vacations. Punta del Hidalgo doesn’t have a plethora of restaurants. Even so, the surfing capital of the island has a couple of great ones that are ready serve. For the best pizza in Punta del Hidalgo, make sure to drop by El Abogado. They have such a wide array of pizza variants; it’s almost impossible for diners not to find one they like. Not only do they serve pizzas with meat or seafood, but they also have white, vegetarian, and unique ones that no one has ever heard of before. Should a customer want something off the menu though, they’ll try to whip one up as best as they could. Pair the pizza with any of their delicious hand-made pasta. Then, for the grand finale, have a bite or two of sinfully good Belgian chocolates. A satisfying meal is guaranteed in El Abogado. They are open every day except Thursday, from 12:30 pm to 4:00 pm and 6:30 pm to 10:30 pm. For the best and freshest seafood in Punta del Hidalgo, Cofradia de Pescadores is the place. Here, customers can see the whole “from the sea to your plates” process, and they do find it very entertaining. The restaurant is at the end of the promenade and just beside a small harbor. Fishers bring their catch as diners choose their fish from the icebox. They then sit next to the kitchen to watch the chefs cook and let the aroma bring heaven down to earth. Sample any of their must-tries: paella, fried octopus (pulpo frito), fish soup, oven-baked fish, chopitos (tiny fried cuttlefish), calamares (deep-fried squid rings), grilled mussels and fish, and lapos (limpets) in garlic butter, to discover why this is the most popular restaurant in town. Boutique del Pan La Tahona Restaurant is busy and packed from the time it opens until it closes. The reason is simple. It is the bakery that makes the best bread and pastries in Punta del Hidalgo. To put it another way, it’s the best bakery in town. Many hikers drop by and stock up before heading for the mountains. Some also sit and have coffee paired with freshly baked bread. For their must-tries, croissant and any of their cakes. Buen provecho. During regular working days, take bus line 105 from Santa Cruz de Tenerife to Punta del Hidalgo. The whole trip takes an hour and 15 minutes. On weekends and holidays, take bus line 15 from Santa Cruz to San Cristóbal de La Laguna, then bus line 50 to Punta del Hidalgo. Although the public transport system of Tenerife is reliable and cheap, hiring a car is ideal. There are a lot of scenic spots on the way up north and tourists driving their cars can stop if they want. Some people say that development in Punta del Hidalgo stopped around the 60s and 70s. Thus, many of its structures aren’t as modish as they would like it to be. Although there is some truth to it, most remain well-maintained, and some others recently renovated. Ask any of the tourists, especially the surfers, and they all never mind the retro feel of the town. Why would they? Tourists never travel up north to stay inside their hotel rooms. They hike the Anaga Mountains to see the El Roque de Los Dos Hermanos and hear about its sad legend from the locals. Others drive on the winding road with one hand outside the window imagining riding the waves. Some are polishing up their Spanish so they can converse with residents about the town. Most pack their swimwear because they will be swimming in the seawater pool all day for a few days. For the growing loyal guests of this windy fishing village, going retro is the only way to go in Punta del Hidalgo.